(Baptised name: Maria Isabella Puzorelli) She is the daughter ofAlberto Puzorelli and the woman only known as Gabrielle. Her mother was a waitress at Goathead, Colorado cafe “Graham’s Goodtime Grill”. She was involved with an Italian man named Alberto Puzorelli, with strong connections to the New York mob under mobster Antoine Puzorelli (his father, her grandfather). Not much was known about their relationship, only that he dumped Gabrielle before he died under circumstances unknown, leaving her unknowingly pregnant with Shadow. 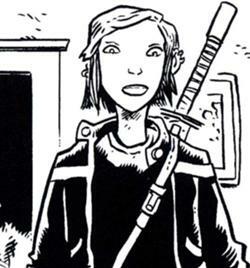 Gabrielle would soon meet Casey Jones at her cafe. It can be assumed they either had a one-night stand or Gabrielle let him stay at her trailer, in the course of which he discovered her pregnant. Though she expected him to leave her, Casey surprisingly stayed. Overtime, their relationship blossomed into love and soon they were married. But this joy was short lived, as Gabrielle or Gabby (so called by Casey) died giving birth to Shadow (TMNT Vol 1, #58). With no other family, Casey became Shadow’s legal guardian. Before returning to his mother, Casey scattered Gabby’s ashes over a cliff. After reuniting his mother, he saw April O’Neil (who would quickly become Shadow’s surrogate mother). Developing a relationship with Michelangelo, who was living with them in the apartment complex at that time, Shadow became fond of video games (TMNT Vol. 2, #13). She once told April she wanted a baby brother. One night when being baby-sat by Michaelangelo, Shadow heard a knock on the door and answered it. Captured by the Foot Clan, she was taken to her paternal grandfather, Antoine Puzorelli. When Raphael learned of Shadow’s abduction he sough council with the Foot, confirming their involvement. He then agreed to kill Antoine Puzorelli for them in exchange for Shadow, a mission he couldn’t complete. Michaelangelo stepped in, disguising himself as a priest in the cathedral where Shadow was to be baptised by Antoine. Only moments after being baptised (making Antoine her godfather), Michaelangelo dropped his disguise and rescued her, taking her to the top of the cathedral and using his shell to make himself appear as part of the gargoyles statues. Shadow was then returned to Casey and April (TMNT Vol. 3, #6 – 8). Antoine Puzorelli then had his thugs put his apartment on surveillance in an attempt to locate Shadow. When April caught on to this and told Casey, Casey, April, and Shadow went into hiding in the Turtles’ current hideout in the mausoleum of Westwood Cemetery. While Shadow watched, Casey accidentally clubbed Raphael when he returned to the hideout, thinking him an intruder. Shadow, Casey, and April met back up with Leonardo and Michaelangelo when they brought Donatello to their mausoleum hideout, where he was then revived (TMNT Vol. 3, #11, 12 & 15). When Leonardo chooses to give up his artificial, removable hand, Shadow asks if she can keep it. Leonardo gives her permission (TMNT Vol. 3, #23).